It took me several years to discover that sailing was something that I could actively participate in safely, given my lack of physical function and sitting balance. I had sailed a bit before, doing the basic RYA levels 1&2 over 5 days at the end of my course at the University in Plymouth. After that I probably only sailed 5 times over the next 8 years. My first experience of disabled sailing was on a Multiactivity course with the Backup Trust 2 years after my accident (pictured right). 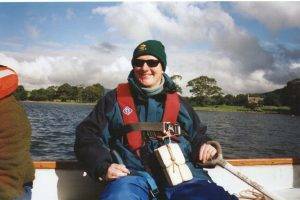 I was seated on a supportive plastic seat on the side of a Lugger with several other members of the group. It was a beautiful to be on Bassenthwaite Lake in Keswick, and I enjoyed the experience, but this didn’t motivate me to get involved. 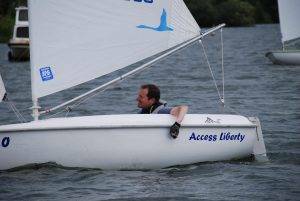 When I returned home, I heard about disabled sailing at South Cerney Outdoor Activity Centre (SCOAC) in the Cotswold Water Park. They had a hoist and a Challenger, which was frequently sailed by somebody in a wheelchair. I was hoisted into the boat, and instantly didn’t feel safe on the seat, and they wouldn’t allow me to be strapped in. They sent somebody out with me, who ended up steering, managing the ropes, and preventing me falling out. This experience made me think that sailing was going to be another activity that I couldn’t do. My parents had got involved in RYA Sailability in Dartmouth, and suggested that they had better adapted equipment at their group. I gave it a go on a visit down there. The group had an Access 303 (now Hansa 303). These are designed with a heavy keel to prevent capsize, and can be sailed either solo, or by two people. This boat had deck chair seating which didn’t offer much support, and my hips prevented the tillers full movement. They had an alternative plan; a joystick control for the steering. I went out with one of the volunteers from the RYA Sailability group, and she had control of the main and jib sheet (the ropes controlling the sails). We successfully got out into the middle of the river Dart, when the wind got up. At this point we discovered that when the boat heeled over to port that my head went under water, and heeling the other way I squashed the quite petite volunteer. The other problem was that without the tiller, there was no way of knowing what angle the rudder was steering. We went round in circles until a horn from a large naval vessel focused our minds and we got back to the pontoon. Again, the experience didn’t leave me enthusiastic about the sport. I had carried on with the Backup Trust, becoming a Group leader for the trips to Sweden doing ski carting. They were looking to fill a place on a Sailing week. Given my experiences of sailing I was very reluctant to do this at all, let alone for a week. Anyway I went. We were blessed with great weather and light winds. Also the Senior Instructor at the Calvert Trust, Nick, had seen it all before and knew just what to do. My disability was a bit beyond what he had dealt with previously, but we tried lots of different things. He created a tube with a V cut in it and gaffer-taped to my hand. The main sheet was run through this, and the V grabbed the rope, which I could then pull and release. The Challenger had a special supportive seat, and I was held upright using a harness with a quick release buckle and a float attached to it, just in case. Wow, I could sail independently. I took to it, and by the end of the week I was beating the others on the course who had much less severe disabilities. If the winds had been stronger it would have been a different story. 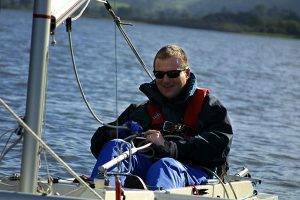 That course had been in the September, and the following year I discovered that only 5 miles from home there was a Sailability Group at Whitefriars Sailing Club in the Cotswold Water Park. Knowing what I needed, the group were able to recreate this with their Challenger. However, the group were very close to the Access Class (Hansa), and had contact with RYA Sailability. They borrowed an Access Liberty which had supportive seating and a joystick which controlled motors that operated the sails. I could now sail independently in stronger winds and have control. They held a regatta for Access (Hansa) boats at Whitefriars, and I had a go. It was a very windy day, and I had very little control. I was terrified, but found it exhilarating, and I could see what was needed to make it work for me. This was the start of my passion for sailing and racing.